Molecor, a company specialized in technology and PVC-O pipe production for water conveyance, introduced its latest Integrated Seal System (ISS+) at K 2013. It is an automated process to insert the gasket automatically in the socket and the enlargement in the range of products, developing the technology to manufacture up to DN 800 mm/30″, PN 25 bars/305 psi, one of the largest PVC-O pipes in the world. Currently the materials used are PVC-U or Ductile Iron, as there is no supplier of PVC-O fittings. 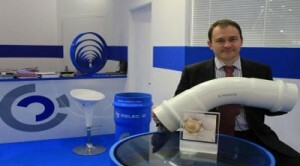 The market possibilities for this new product line are promising, according to Molecor Tech CEO, Ignacio Muñoz. As said, the prototype fittings have been validated and during 2014 the industrial development will be finalized. The PVC-O fittings will be available for Molecor licensees at the beginning of 2015.